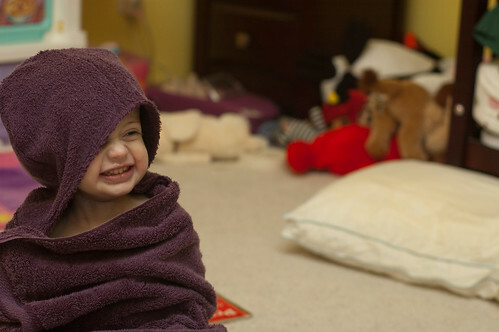 When Lillian was a baby we always used a hooded towel after her bath. As she got bigger the towels became too small and the larger ones seem to be really expensive. So I decided to make one myself even though Lillian got an elephant towel from her aunt. Who can have too many hooded towels anyway? While looking online I found a bunch of different tutorials but I just wasn’t happy with them…one required bias tape (seemed like a lot of work) and a few had crazy pointed hoods, so I took the elephant towel and based my pattern off of it. Actually, my husband made the pattern pieces after I showed him a general sketch of what I was looking for. He’s great like that. To start off you will need one bath towel, one hand towel, the hood pattern pieces, and a cutie to model the towel after you are finished. The pattern pieces can be downloaded here. As a side note, cutting a towel is messy, so be ready for that and have your cleaning supplies on hand for when you are finished. I had to clean my machine after this project because there were fibers everywhere! 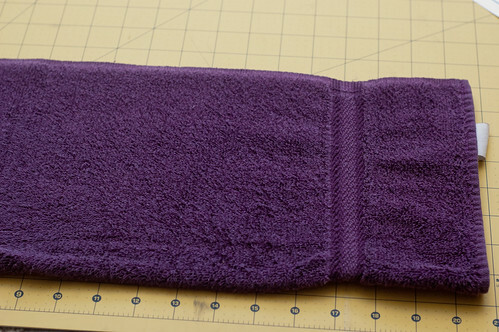 Now to get started…fold the hand towel in half with the long edges touching and the wrong sides facing. 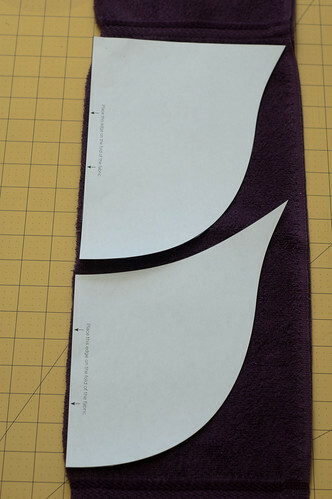 Cut out each hood piece and don’t forget to place the edge against the fold of the towel. My towel had decorative stitching near the ends but I was still able to fit both hood pieces between them. To hem, I just folded the edge under about 1/4” and sewed two lines. The reason I did two lines was because a towel is so thick that the second line helps the hem stay down a little better. If you have matching thread you won’t even notice so don’t worry too much if your lines aren’t evenly spaced. Ok, sorry, back on track. 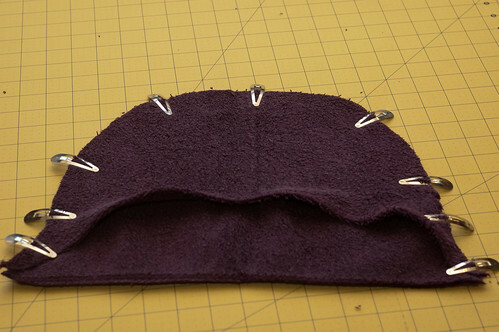 With right sides facing, place the hood front and back together and sew around the top using a 1/4” seam allowance. Then overlock this edge and turn right side out. With the bath towel right side up (side that you want to be the outside of the towel) and the hood with back toward towel (this would be down), find the center of both pieces and pin (I used binding clips) together. Sew along the edge where the hood and bath towel meet with a 3/8” seam allowance. Don’t forget to lock your stitch. Then overlock the edge and sew it down toward the bath towel, using two lines again. This helps so that the overlocked edge doesn’t scratch your child. Your towel is now complete. Now it’s time to test it out after bath time. 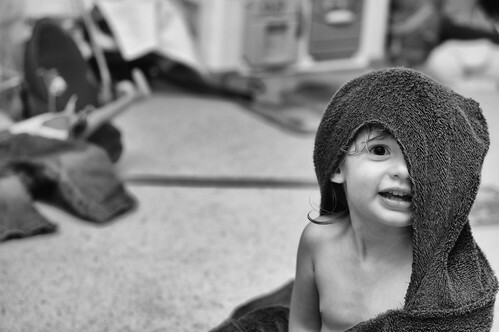 After drying your cutie, cuddle with them for a little while so that they can enjoy their new towel. And of course so you can enjoy the cuddle time. You could also add applique, ribbons, or anything else to this towel to personalize it. Let your imagination go to work! I have a few ideas that I want to try and when I do, I will be sure to share with you. I was just talking about ordering some hooded towels for my baby boy (so he doesn’t have to be a pink kitty after baths anymore), so this is *great* – I can sew my own for him (and some for his sisters, too!) For some reason, I can’t follow the link to the pattern pieces. I just get the google drive page 🙂 Can you help me out? Thank you! I updated the link so it should work now. Let me know if it doesn’t and I will try something else. Have fun! Thank you so much and for getting back to me so quickly! I can’t wait to get started! i JUST DOWNLAODED THE HOODED TOWEL PATTERN. I HAVE NOT SEWN IN YEARS. I AM A GRANDMOTHER. I NO LONGER OWN A SEWING MACHINE. DO SOME OF THE FABRIC STORES LET YOU USE A MACHINE IN THE STORE FOR A FEE? AGES AGO, SEWING WAS MY MIDDLE NAME. I WANT TO MAKE SEVERAL OF THESE FOR MY 4 GRANDCHILDREN. I ve been sewing for yrs and other than taking classes at places like Joann Fabrics, I don’t know of them letting you use their machines. I would just buy a basic machine at Walmart. (Or ask for one as a Birthday/Christmas Present) You could probally get something nice for under $100. That way you can use it anytime you desire & also save $$$ when some article of clothing needs repaired instead of paying a Alterations Shop. I see your post is several yrs old so hopefully my advice is not too late. Thank you for the instructions! I can’t wait to make these for my boys! I am having trouble getting the link to print for the pattern pieces. Any suggestions? I am not really sure how you would do this. Maybe make the towel in the tutorial and then just add another towel by sewing them together but only on the sides and a small part of the top. That way it can slip over her head and the hood would still go on her head. You could even just sew a little of the sides together for arm holes. So on the top part (with the hood) you would only sew from the corner to the hood or even less depending on how big her head is. Good luck! Hey Lindsey and Danielle. Look what I found today! http://www.deliacreates.com/2012/06/blue-hooded-towel-poncho.html A tutorial fo ra poncho style hooded towel. You could easily use my pattern piece and assemble the same as Delia did. Hopefully this works out for you! 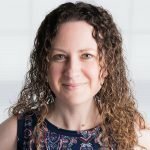 Pingback: Happy Holidays Sewing Novice | Sewing Novice - A beginner's resource for learning to sew. 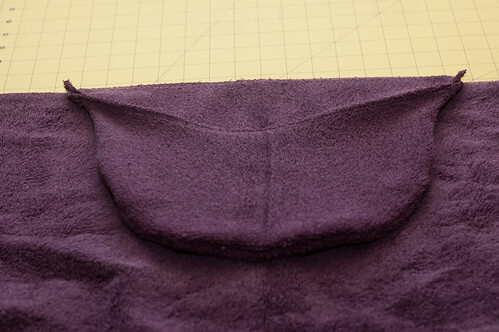 Pingback: Monster Hooded Towel Tutorial Sewing Novice | Sewing Novice - A beginner's resource for learning to sew. ԝith after that you сan writee othᥱrwise іt is complex tⲟo writе.